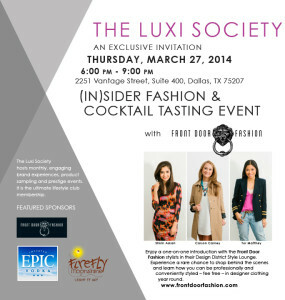 Dallas has a slew of events coming up for local fashionistas and foodies! Check out the details below to see what’s coming up. Enjoy! Designer Edo Popken with Fashion Show Producer, Rhonda Sargent Chambers of RSC Productions, will host Edo Popken’s Best Dressed 2014 benefitting America Scores on Wednesday, March 26 at the Dallas Flagship store. The runway show produced by Rhonda Sargent Chambers will begin at 7:30p.m. featuring FC Dallas players. Guests will enjoy complimentary nibbles and Dapper Dandy cocktails by Reyka Vodka and Solerno. Proceeds will benefit America Scores. Enjoy a one-on-one intro with stylists from Front Door Fashion in Dallas’ Design District. Learn how to be styled in designer clothes year round- for free! The event will be held on March 27 from 6 to 9 p.m.
Mockingbird Station and CultureMap Dallas, cordially invite you to the spring What to Wear Fashion Show on Thursday, March 27, from 6 to 8 p.m. on the second level Mezzanine outside the Angelika Film Center. The Station’s annual outdoor soiree will feature commentary from a panel of style experts, who will roll out what’s fresh for spring travel season. Get into the spirit of adventure with a French getaway inspired fashion show, a chance to win a trip to Paris, gorgeous models, complimentary cocktails courtesy of Deep Eddy Vodka, bites from Cafe Express, live music by DJ Blake Ward and a special post-show performance by The O’s. While you are there, be sure to register at the CultureMap Dallas table for a chance to win a trip to Paris. The promotion runs until April 15. In addition, there will be prizes for our most tres chic attendees, so feel free to wear your most resort inspired ensemble. For more information, visit Mockingbirdstation.com/events. Design & Dine is an evening tailored to your tastes and styles. So, come experience a night of food, fashion and fun, as some of DFW’s top restaurants, designers and celebrities gather together at Classic BMW in Plano for one magical evening. Additionally, a portion of the night’s event proceeds will benefit Junior League of Collin County. Design & Dine lives up to its name by way of its showcasing five curated designers (including Abi Ferrin), fashion show producer, stylist Willie Johnson III and CBS Radio, to go along-side the restaurant, spirit and wine samplings that will be featured. All this excitement will be led by lifestyle guru Steve Kemble and KVIL-FM. Sampling restaurants to include: Truluck’s, Ra Sushi, Capital Grille, Scardello Artisan Cheese, Cru Wine Bar, Bavarian Grill and more. For ticket information please visit the website. Belk is gearing up to open its first flagship location in Texas at the Galleria Dallas with a not-to-be-missed charity event benefiting Susan G. Komen on April 3 from 7 to 10 p.m.
Don’t miss appearances by the Dallas Cowboys cheerleaders and Belk brand ambassador Hayden Panettiere! There will also be a fashion show and giveaways including five $1,000 shopping sprees and an autographed guitar by Blake Shelton. All attendees will receive a $25 gift card. 100 percent of all donations will benefit Susan G. Komen. Purchase tickets here. The goal of the event is to raise $50,000 to benefit the Dallas County and North Texas Affiliates of Susan G. Komen. The funds raised will help support those in the fight to save lives, as well as, educate local residents about breast cancer risk factors, the importance of early detection and the resources available to them. This is in addition to the $125,000 commitment Belk will present to five community partners, Junior League of Collin County, Junior League of Dallas, Pat and Emmitt Smith Charities, United Way of Metropolitan Dallas and YWCA Dallas, at the official ribbon cutting on Wednesday, April 9.